New Buildings Farm Boarding Kennels are situated just outside of a small village called Hilderstone. 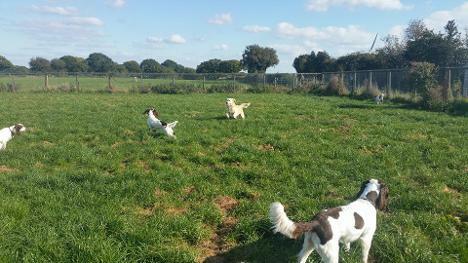 They are a quality purpose built kennels set in the idyllic rural countryside of Staffordshire, the perfect place to let your beloved pet unwind. The kennels are set on a private drive on a dairy farm, with acres of fields and woodland. Dogs can be let off lead in our fenced field or walked around the surrounding fields and a 3 mile track. In colder months the kennels can be heated and extra bedding will be given to our guests. Any dog of any breed and age are welcome and if your dog/s has special requirements for example is on medication this is not a problem. A bathing service is also available, so your dogs can be brushed, bathed and will smell and look great when you collect them. Day boarders are also welcome and due to us being a large kennels there is usually space for last minute bookings, however during the summer holidays availability is usually limited. The Kennels are Licensed with Staffordshire Moorlands District Council under Animal Boarding Establishment Act 1963 and all dogs that come into the kennels are covered by Petplan insurance.